Our first "WTF?! Accessory" nomination – Burgers on the go! You’ve seen slicers and dicers and George Foreman grills… but have you ever seen something that combines the fat-free, grilling goodness of the Foremen with the fun of scootin’ around town? Introducing The Exhaust Burger! The cool thing about the scooter version is that 2-strokers won’t even need a non-stick spray… ESPECIALLY if you’re running rich. Ok, it’s not as bad as it seems. 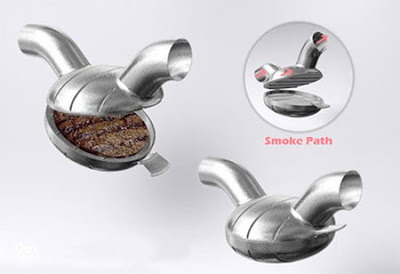 This device is from the “Dining 2015″ competition and the exhaust doesn’t really bathe the burger with delicious carbon monoxide and 2-stroke oil. It just heats the pan. Now THIS is some global warming I could learn to love. Here is a story on an exhaust cooker from 1931. 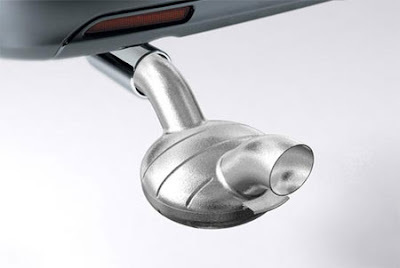 I remember a few years ago a company marketed a grill that you set on top of the engine block. It would cook hotdogs, hamburgers and anything else you wanted to have real greasy. Mmm, a nice curry wurst or bratwurst would be nice! News Flash! The SYM version of the Cub is OFFICIALLY headed our way! Watch out, this scoop is still smokin'! - Yamaha to announce T-Max for US Market in 2009! © 2019 TheScooterScoop. Powered by Wordpress.